Google Assistant is now receiving the Pretty Please feature that was announced back at I/O 2018. The feature is designed to provide positive reinforcement to users, especially kids, to use polite behaviour while communicating with machines. It enables the voice assistant to reward the usage of “please” and “thank you” with delightful responses. Separately, the Google Assistant has also been updated with the ability to build notes and lists using your voice. Google Home devices are also receiving an update with a Broadcast Replies feature that helps you broadcast your message across all Google Assistant-based devices. The ultimate aim with the Pretty Please feature is not just to reinforce polite behaviour towards Google Assistant devices but also to encourage people to have politeness in their daily lives. This is important especially in the case of kids who aren’t using polite words such as “please” and “thank you” while communicating with their friends and elders. In addition to the Pretty Please feature, the Google Assistant has received the ability to create notes and lists simply by using your voice. You just need to say something like, “Create a gift list” or “Add Sunday party to my to-do list.” You can also take a look at what’s previously available in your notes or lists by saying, “Show me my last note” or “What’s on my to-do list?” Similar to the Pretty Please feature, the notes and lists integration within the Google Assistant was announced at I/O 2018 earlier this year. The feature presently works with a built-in notes and to-do list version, though third-party support from Google Keep, Any.do, Bring!, and Todoist is coming soon. Google has also upgraded the experience on Google Assistant-powered Smart Displays by enabling lyrics support. This means you can now watch synchronised lyrics of the song you’re playing on your Smart Display. The new addition works only with Google Play Music subscription, and you need to say something like, “Hey Google, play ‘Jingle Bell Rock’ on Google Play Music.” Initially, the experience is available for select songs. Smart Displays such as Google Home Hub are indeed the next big focus for the search giant. Therefore, it is also bringing the Broadcast Replies feature. 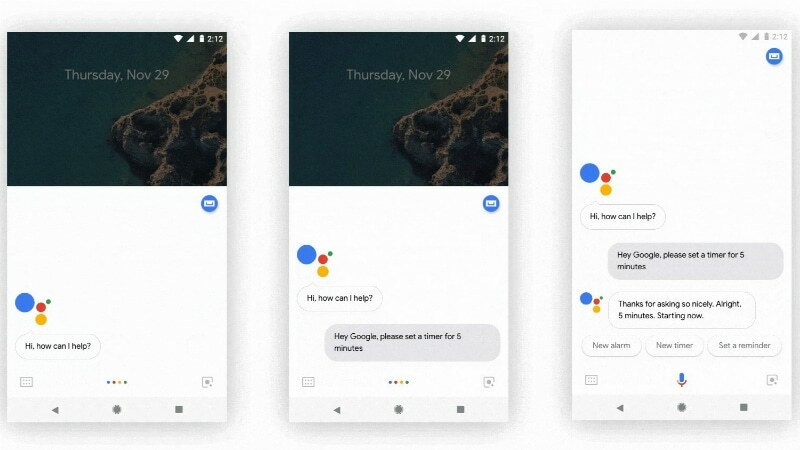 This new development is designed to let users easily communicate with multiple Google Assistant devices simultaneously and broadcast their message without having many efforts. Starting next week, you’ll be able to use the feature to communicate between a Google Assistant-powered Smart Display or speaker and your smartphone and Google Home device. When receiving a message on the Google Assistant available on your phone, you can use the Broadcast Replies feature to reply it using the virtual keyboard, while Smart Displays feature a dedicated ‘Reply’ button to help you respond easily. You can also reply back from a smart speaker or Smart Display to your smartphone or other Google Home devices. Google is also bringing a way to let you easily share photos featured on your Smart Display with any of the persons in your contact list. You just need to say “Hey Google, share this photo with [your contact’s name]” to share the visible photo with your contact. Similarly, you can also hide a photo from your ambient screen or set a photo as favourite. You can also swipe up from the home screen and tap the new timer button to set an alarm on your Google Assistant-based Smart Display. Celebrating the Christmas season, the Google Assistant has received an update to the Call Santa feature. It now comes with a musical touch that you can experience by saying “Hey Google, Call Santa.” You can also use the same voice command on your Smart Display to see various album covers. Furthermore, the Google Assistant has received the ability to read along with a book. There are classic books such as Disney’s “Mickey’s Christmas Carol” Little Golden Book. You need to say “Hey Google, let’s read along with [book name]”. Also, Google now offers over 50 story titles like “Beauty and the Beast,” “Cinderella,” and Dora the Explorer’s “Dora’s Super Sleepover” among others. It is also adding new holiday content by Nickelodeon such as “Albert: The Little Tree with Big Dreams,” Blaze and the Monster Machines’ “A Monster Machine Christmas,” Dora the Explorer’s “The Little Christmas Tree,” PAW Patrol’s “Holiday Helpers!” and Shimmer and Shine’s “Santa’s Christmas Genies.” You just need to say “Hey Google, tell me a story about Christmas” or “Hey Google, tell me a winter story” to experience the new addition. In other news, a new commit posted to Chromium’s Gerrit source code management reveals that the Family Link will be upgraded to enable native Google Assistant support on Chromebooks to let children use the voice assistant for their tasks. The commit shows that Google can remotely activate the new feature. Likewise, it comes in line with another commit that removed all the Assistant restrictions available for Family Link accounts. Folks at 9to5Google reported about the existence of the new commit.